Eventually, Senn was released from police custody and deported to the Tyrol. The document that concluded Senn's detention seems to have been lost. We therefore have no knowledge of the legal conditions of his deportation and exile. The secondary sources just contain rumour and speculation on this important point. We know from a letter written by Police Chief Sedlnitzky on 24 February 1823 to Joseph Amberg (1778-1869), the Police Director in Innsbruck, that one of the conditions of the deportation to the Tyrol of this 'dangerous individual' Senn was a ban on teaching, so that he would have no opportunity to twist the minds of the young with his fantasies. In the same letter Sedlnitzky also mentions the police monitoring of Senn in Innsbruck. The existence of this monitoring was probably also openly declared to Senn, otherwise how would they know whether he was teaching or not? Senn would also have known that the police were intercepting and reading his mail, whether he was told explicitly or not: everyone who was anyone in the Austrian Empire knew that their mail might be being read – even half a century before, Mozart had taken precautions with his correspondence. Senn, now a suspect figure, would have had no doubt on this point. Even the names of all the senders and the recipients of his correspondence would be meticulously recorded by the police. Because of this, almost every letter that he and his friends exchanged went through one or more intermediaries. Letters were often written by one person in the name of another. Writing in anything other than clear text or using cover names would have alerted the authorities immediately. A record exists of a discussion between Amberg and Sedlnitzky of a mysterious, incomprehensible letter containing coded names – 'the Griffin', for example – which had come into their possession. Without any concrete evidence Sedlnitzky attributed the letter to Senn as being characteristic of his 'fantastical' style and ordered even closer monitoring of him. The incident illustrates the permanent danger Senn was in: even if he didn't do anything he could be implicated at any time. The ban on teaching was the principal cause of the misery which afflicted the rest of his life. He was not a man who aspired to luxury: he could manage on a modest income and would probably find that laudable. Up until his arrest he had muddled through with private teaching to support himself. He had no university qualification and no chance of a career in the imperial bureacracy. Denying him the chance to earn a living as a private teacher had effectively pauperised him. After his move to Innsbruck he was penniless. His father had been dead ten years, his elder sister, Theresia, was living far away in Graz, his stepmother was living on a widow's pension with her two children in Vienna. He reluctantly borrowed small amounts from well-off friends, but his income was barely sufficient to cover his minimal daily necessities, never mind pay his friends back. He seems to have inherited not only stubbornness but a very rigid sense of propriety from his father: as his prospects of ever earning enough to pay back these small debts got worse his mind became beclouded by unease. Senn's friend Aloys Fischer wrote a long letter on 18 February 1823 to their mutual friend Franz Bruchmann describing in detail the difficulties Senn experienced after moving to Innsbruck. Readers who have not spared on the coffee drinking and who are thus still awake – if a little trembly – will recall that Aloys Fischer was the student whose farewell party on 20 February 1820 (almost exactly three years previously) had been the occasion for the start of the police action that resulted in Senn's arrest. Fischer was now a student in Innsbruck. According to Fischer, Senn's life was miserable from the moment he arrived in Innsbruck. The police persecuted him at every opportunity. He was frequently seen in the company of young people who had already been involved in the previous investigation. He was lucky not to be arrested for this again. The general public's opinion of Senn was also bad: he was thought to be an atheist, one of the worst possible things to be in the deeply devout Tyrol. Professors and parents had complained to the police and requested that he be forbidden from contact with young people. The police noted that even military personnel were annoyed by what Senn said. We can only note that the man now celebrated as a Tyrolean 'freedom fighter' and 'hero of the people' seems to have been roundly rejected by the people he was supposedly trying to free. Not long after his release he had sought an escape possibility in a move to Bavaria. As we saw in the case of Franz Seraph Spaun, who spent the last part of his life there, it was possible for troublemakers to survive in Bavaria, if not flourish. Senn had contacted a certain Professor Feilmoser about obtaining a post. Feilmoser himself was a troublemaker: he was a theologian who had been ejected from his chair at the University of Innsbruck and who was now at Tübingen. Feilmoser rejected Senn's advance so cooly that Senn gave up the attempt. Senn tried without luck to get relatives to lend him 100 florins to pay off his debts. He thought of going to Graz to work as a solicitor in a law office. Bruchmann, the son of a rich industrialist, had started to send him some money every month, which seemed to worry him as much as it helped him. 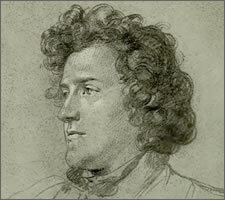 In desperation he finally did something superficially so crazed that we have to question his state of mind: in early February 1823 he joined the army. 'Joined the army' is correct but misleading. In fact he sold himself – or more precisely, at least the next eight years of his life – to an Italian Tyrolean who had been conscripted into the Kaiser-Jägerregiment, the 'Imperial Fusilier Regiment'. At that time in Tyrol the actual conscripts were chosen by drawing lots among the eligible non-volunteers. The chosen ones who had money could still dodge the draft by paying someone else, Einstandsmänner, 'substitutes', to do their military service in their place. Substitutes might be paid as much as 1,200 florins for their service. Our writer, philosopher and poet Senn sold himself for a lump sum of only 600 florins, just sufficient to pay back his debts. He didn't, he said, want to profit from the arrangement, thus taking altruism to a new level of perversity. The draft dodger must have thought that his guardian angel had come down upon the earth to release him from spending the next eight years in the army. On the other hand, perhaps it wasn't such a bad idea. At least in the army Senn would be fed, sheltered and even get some pennies, which was probably preferable to starving altruistically to death on the streets of Innsbruck. It may also be the case that Senn thought that a life in the army might shield him from the daily attentions of the secret police, their spies and their narks. Nor should we underestimate his deep Tyrolean patriotism and his deep – genetically deep – Tyrolean love for rifles. In the Kaiser-Jägerregiment special emphasis was placed on marksmanship, which involved much more shooting practice than usual in other regiments. The Schützenkompanie Pfunds, the 'Rifle Company of Pfunds' marking the unveiling on 15 August 2013 of a commemorative plaque to their former captain, Franz Michael Senn, father of Johann, by shooting a barn. Image: Musikkapelle Pfunds. I've just received the first letter from Senn. He writes that things are neither going well nor badly for him, that he drills much too little, which is a stupid situation. By the way, the military life is the non plus ultra of masculine being; weapons are the highest desire of character. Because the softness of civilian life finds that too rough, only one career remains in which the knowledge and use of weapons is exhaustively collected and pursued as an art. He is delighted by his short-barrelled rifle, which would be a distinction among hunters. He is full of expectations combined with a resignation that includes all conceivable ills. He says that what troubles him is the excessive comfort, the lack of clarity and decisiveness that has arisen in these times of peace. Fischer tells us that Senn had toyed with the idea of joining the army for the last 18 months, only the arguments of his friends had dissuaded him. When he finally did so his colonel at first wanted to send him to Hall, near Innsbruck, as a teacher in the army educational corps there. Senn, once again flagellating himself with his masochistic principles, never one for the easy option where a painful one was also available, insisted that he should become a common soldier himself before he was able to teach soldiers. This desire impressed the colonel, who sent him to the 1st Battalion of the 3rd Company in Trient under the command of Captain Roqueville, who, we are told, had shortly before been involved in some way in the famous deed of the Kaiser-Jägerregiment: passing through Mantua on their way back from Naples a group of them exhumed Andreas Hofer's bones and returned them to Innsbruck in January 1823, thus closing the book on Bonaparte's Tyrolean adventures. They had acted on their own initiative as Tyrolean patriots, but caused no little embarrassment to the great and the good in Vienna, who would have preferred not to be reminded of their shameful sell-out of the Tyrol. They got away with it though: Roqueville remained a captain until 1826. 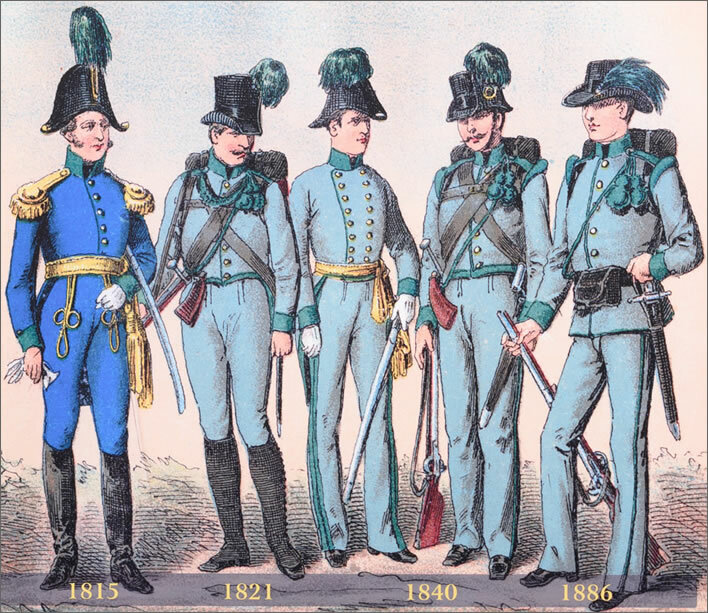 Uniforms of the Kaiserjäger Regiment. Of the 600 florins Senn had received for taking the unwilling recruit's place, Aloys Fischer tells us that 120 florins were paid to the regiment, 80 florins went in tax and 360 florins paid his debts off. He had 40 florins to his name when he left for his regiment. At the time Senn joined up there was a ruling in place that the money paid to substitutes was held by the army for them until they had completed their service, a measure intended to prevent desertion as well as the squandering of the sum in a short period of debauchery. Perhaps Senn was able to persuade the army to pay out specific sums to his debtors. Fischer tells us that Senn burned a lot of his writings – probably wisely, as we are about to see. All his correspondence was opened by his captain, so his friends wrote to him at a nearby address, poste restante. A relatively reliable way of finding out what Senn did in this period is reading what the secret police reported about him. He was indeed carefully observed. An important moment in their monitoring of Senn came when the police intercepted a letter written at some time in February 1823 by Aloys Fischer in Innsbruck to his brother Anton in Brixen (now South Tyrol). We are not surprised to learn now that the police had been reading and copying Fischer's correspondence. February's intercept made them sit up and take notice: Senn! I would be living quietly and happily, if fate hadn't torn my best friend from my side and locked him away in the barracks. That is, our Senn —. He enlisted as a conscript substitute for an Italian farmer in return for a small sum. Nothing could dissuade him and so yesterday he marched off with a crowd of other recruits to Italy. — This action not only shook all his friends, even others are wailing about it. Bravely and calmly he put on the colourful uniform and placed himself under the command of the military despotism. May he have better days as a soldier than he did as a citizen! I have inherited here all his things. His books and manuscripts he left behind with me. There are some wonderful examples of his high and pure mind among them. How I would like to send them to you, if only they were more orderly and I did not have to fear that they might be misunderstood by you. So I'll keep them here and bring them with me in the next holiday to read with you. Schober's poems I have, too; really a great treasure! In respect of this situation I would like you above all to verify that the statements contained in the letter are correct: that the exile Senn has been recruited into the military and in this capacity has already gone to Italy. I also ask you to apply whatever measures you deem appropriate to ensure that no harm is caused by the misuse of Senn's papers and manuscripts which are now in the possession of the student Fischer, as well as from 'Schober's poems' mentioned by the writer, which will probably have the same corrupting tendency as Senn's fantastic products. Furthermore, Fischer himself, judging from the way he expresses himself in his letter and from the enthusiasm with which he clings to his friend and his delusions, prompts a desire [on our part] to get to know about him more closely. The need for careful monitoring of him is obvious. The said Johann Senn, who was for a long time was under police investigation and arrest in Vienna, and who two years ago was deported to the Tyrol, became a soldier about six weeks ago. He joined up with the local Imperial Fusilier Regiment in the place of a conscript from South Tyrol and has alread marched off to join the regiment's first battalion in Trient. The mental burden that a few, meaningless debts that he run up in the time of his greatest need led him to this step, over which he, it seems, has up to now not felt the slightest regret. When Senn arrived here two years ago he had no support from any side. It was against his principles to even seek it. He would have starved, had it not been for the former Professor Khüeny and his relatives, the two brothers Joseph and Aloys Fischer, of whom the first is an assistant by the War Dead Administration and the latter a fourth-year Law student who took pity on him and tactfully did what was necessary for him to survive. Several months passed until he was employed a copyist for the local lawyer Widmann, who exploited his great talent and extreme industry for the miserable wage of 15 florins per month. Senn wprked for him for nearly two years. Senn has never had great material desires, which made the demands of his intellect just so much greater. From a wage that only allows for an existence in poverty there was no money to spare to buy the odd expensive book now and again. This caused him to build up small debts, which have now driven him to choose to substitute for a conscript at a price without pecuniary advantage for himself in order to pay them off. During his residence here his conduct has been extremely proper and religious. I acquired his trust and would have been able to have had an influence on him in every respect, had I not been misled by the available information and tolerated his association with Professor Khüeny. Now it's our turn to sit up and pay careful attention to this letter. After the bureaucratic introduction, a surprisingly humane tone has crept in. Amberg recounts with unmistakable sympathy Senn's difficult situation on his arrival in Innsbruck and does not disguise his shock at Senn's exploitation by the swine lawyer Widmann. Amberg tells us of Senn's upright, faultless behaviour, his piety, his concern over minute debts and his extraordinary, principled response to them. We are left with the impression that any normal state would be glad of a citizen of such probity as Senn. Unfortunately, the state in question here is the Austrian Empire, to which the word 'normal' can have no application. Amberg is effectively pleading Senn's case to Sedlnitzky, an extraordinarily risky thing to do given Sedlnitzky's unconcealed detestation of Senn and his dangerous daydreams. Still, the aristocrat Police Chief would be one of the first in the tumbrils, so has a personal interest in stopping hotheads like Senn. We also learn that Amberg befriended Senn, a surprising task for the local Director of Police to undertake himself – we would have expected him to set some nark onto this task. In doing this he is running the risk of compromising himself. Why? From all that Amberg has written about Senn so far in this letter, we are left with the impression that the friendship was not totally one-sided. Amberg tells us, sounding rather hurt, that he might not have been so soft on Senn if he had known about his contacts with another police suspect, Professor Khüeny. I am now in possession of the books and manuscripts which Senn left to Aloys Fischer. The manuscripts comprise beside a few small notebooks some poems written by Senn some years ago, the contents of which seem to be harmless, some sheets of scattered thoughts on natural, private and constitutional law, as well as a number of fragments bearing the unmistakeable odour of the new corrupting philosophy [=Hegelianism]. I must ask for your Excellency's gracious instruction about what should happen to these books and manuscripts. In my humble and respectful opinion [only a few of the books and manuscripts, including the poems] should be returned to Alois Fischer since he himself is one of those suspect youths whose participation with other students in the meeting in Vienna which caused your Excellency to command my predecessor […] on 25 March 1820 to initiate official proceedings. Furthermore, not only have I contacted the respected colonel of the Imperial Fusilier Regiment and made him aware, in confidence, of Senn's inclination to political daydreaming, but I have also most forcefully recommended to the Chief Commissioner of Police in Trient, von Cronenfels, that Senn should be monitored as long as he is in the barracks there. Ibid 179. The colonel at that time was Daniel Baroni von Cavalcabò. The Police Commissioner in Trient (between 1816-1847) was Wenzel Ritter von Kronenfels. We can imagine that the Colonel had not much time for secret policemen like Amberg: would you want spies and narks sniffing around the troops under your command? In any case, the army had plenty of experience in dealing with the riff-raff in their ranks without help from secret policemen – petty criminals, for example, were explicitly not excluded from becoming recruits. Perhaps Amberg is overstating the vigour of his 'confidential' note for Sedlnitzky's benefit. Who knows? It is a fine joke – perhaps by the Colonel himself – that Senn, the political daydreamer who was banned from teaching activities in civilian life, ended up teaching young men in the army's Cadet School from 1823 until his retirement. Shortly before his retirement he was appointed as Professur des Militär-Geschäftsstyls, 'Professor of Military Communication'. Eight years of doing exactly what he was not supposed to! If I may allow myself the most respectfully subservient observation, that I have no doubt that military life may have a beneficial effect on Senn's bleak mood, change his principles and that, in accordance with his strong religious nature, he will not break his military Oath of Allegiance. Amberg had definitely gone soft on Senn, despite all his posturing towards Sedlnitzky. We note with interest that it was in fact Sedlnitzky who kicked off the present action when he picked up on the mention of Senn in Fischer's letter, which was only one letter among a bundle of intercepts that had been passed on to him by Amberg. We can only conclude that either Amberg couldn't be bothered to read his own intercepts or did not grasp the importance of them or, most likely, did not dare to make on his own judgements that might come back to haunt him. So it was in the Empire of Paperwork: fear of failure caused all but the most trivial decisions to float upwards in copies of copies to the highest possible level. In his response, Sedlnitzky gives us no hint that he is responding to something to which Amberg has alerted him – on the contrary, appreciating the significance of Fischer's letter and its mention of Senn is clearly entirely Sedlnitzky's doing, hence the particular force of his instructions to Amberg. Count Sedlnitzky did not remain Franz I's feared Chief of Police for more than 30 years by letting things slide – both Franz the micromanager and Prince Metternich repeatedly wrote to him demanding explanations for this or that event that they felt had escaped his attention. That's also how it was in the Empire of Paperwork: a top down pyramid of bureaucratic control, its culture trickling down from Franz I's fearful mistrust and obsession with detail. In that feudal administrative structure, where position was determined by social rank, Count Sedlnitzky frequently got it in the neck from Emperor or Prince and ensured that the same happened to his own lowly underlings. Taken in this context we have to see Amberg's positive words about Senn as an extremely brave action. Was he also a Tyrolean at heart? More questions we cannot answer. We speculate happily, but that is all it is, speculation. Amberg's career certainly did not suffer. Four years after these exchanges, in 1826, the lowly worm was ennobled, after which we should now refer to him as Joseph von Amberg. The following year he followed his predecessor in Innsbruck to become, in April 1828 the General Director of Police in Venice, then a few years later the General Director of Police in Vienna – still under Sedlnitzky, though. Despite all this police activity, Senn would have a good career with the army – at least, for someone from the lower orders. The second-in-command when he joined up, Lieutenant Colonel Josef Count Sickingen-Hohenburg, was a very active innovator and set up in Innsbruck in December of 1823 a Cadet School for the education of future officers. In this context we can understand why Sickingen was keen to get recruits like Senn teaching in his new school. Sickingen replaced Daniel Baroni von Cavalcabò as the regiment's colonel in 1824/5. Senn started teaching in the Cadet School in 1925 and was promoted to second-lieutenant around 1828, which rank he held until he left the army. Sickingen himself left the regiment shortly afterwards, in 1832. And the final thing that we must not overlook is that Johann Senn stayed longer in the army than he needed to. The period of service for conscripts was eight years. In 1828 he had been made an Oberjäger, a second-lieutenant, and had thus become an officer. According to Pichler, reading a testimonial written by Graf von Sickingen, on 16 May 1831 Senn retired as a military invalid on an annual pension of 200 florins. That pension is entirely due to his becoming an officer and being pensioned off for a service invalidity. Had he left the army punctually at the end of his eight-year service period, he would have got nothing and would have had to go back to starving on the streets of Innsbruck. With 200 florins a year he could now go back to almost starving on the streets of Innsbruck. Sickingen gave the length of Senn's service as nine years and eleven months, a period that cannot be reconciled with the date of Senn's recruitment, February 1823 and the date of his retirement. Perhaps military bookeeping is not infallible after all. I supply herewith this testimonial, that [Johann Senn] between 1823 and 1831 worked in the Cadet School of the regiment as a teacher of the German language, military communication, history and geography. In this activity he not only displayed his own extensive knowledge in the said subjects but also developed an enthusiasm and energy, as a result of which his teaching was marked by great success and gained the special satisfaction and gratitude of the commander of the regiment. His thoughtful spirit and extensive academic education was combined with a very upright character. I thus count it as my most pleasurable duty to recommend him highly to whomever he may apply for a position in order to improve his situation.